The MultiSense SL unit stores a unique calibration to transform laser range data into the left camera optical frame. This calibration is comprised of two static transforms; one from the motor frame to the left camera frame, the other from the laser frame to the spindle frame. There is an additional transform between the spindle frame and the motor frame which accounts for the rotation of the laser spindle. The MultiSense ROS driver automatically generates a transform tree based on these three transforms. Additionally both the ROS driver and the underlying API offer mechanisms to perform custom transformations of laser data. The following sections detail this transform tree and provide a basic example of how to perform this transformation. The MultiSense SL has three primary transforms between the four coordinate frames which are used to transform laser range data into the left camera optical frame. The first transform is a static transform between the fixed motor frame and the left camera frame which is described by the homogeneous transform matrix HCM. In the ROS driver this transform is referred to as cameraToSpindleFixed. The second transform is between the spindle frame and the fixed motor frame which is described by the homogeneous transform matrix HMS. This transform accounts for the spindle frame’s rotation about the z-axis of the fixed motor frame as the laser spins. The final transform is static between the laser frame and the spindle frame which is described by the homogeneous transform matrix HSL. In the ROS driver HSL is referred to as laserToSpindle. By multiplying these homogeneous transform matrices together a laser range point in Cartesian space can be transformed into the left camera frame. Where dL is a 4x1 matrix representing a single laser point in the x-z plane of the laser’s local frame and dc is a 4x1 matrix representing a single laser point in the left camera’s optical frame. The MultiSense ROS driver uses the robot_state_publisher ROS package to create the initial transform tree using the URDF file in the multisense_description package. In addition, the robot_state_publisher and /multisense/joint_states messages are used to manage the transform between the motor and laser spindle corresponding to HMS. A final static transformation between /multisense/hokuyo_link and /multisense/head_hokuyo_frame is required to properly display the /multisense/lidar_scan topic in RViz. 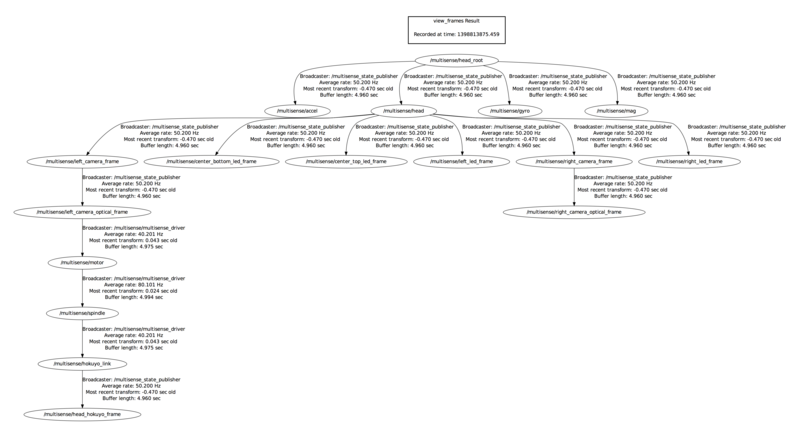 The full ROS transform tree is shown below. The MultiSense ROS driver offers three primary mechanisms to process and view laser data: the /multisense/lidar_scan, /multisense/lidar_points2, and /multisense/calibration/raw_lidar_data topics. In addition to laser data, the driver presents the raw calibration matrices on the /multisense/calibration/raw_lidar_cal topic. The /multisense/lidar_scan topic is a sensor_msgs/LaserScan message containing the raw laser range and intensity data in polar coordinates along with information used to interpolate the Cartesian position of each range reading. The transformation of the laser data into the /multisense/left_camera_optical_frame is managed by the transform tree constructed by the robot_state_publisher and the per-scan published full HCM and HSL transforms managed by the ROS driver. 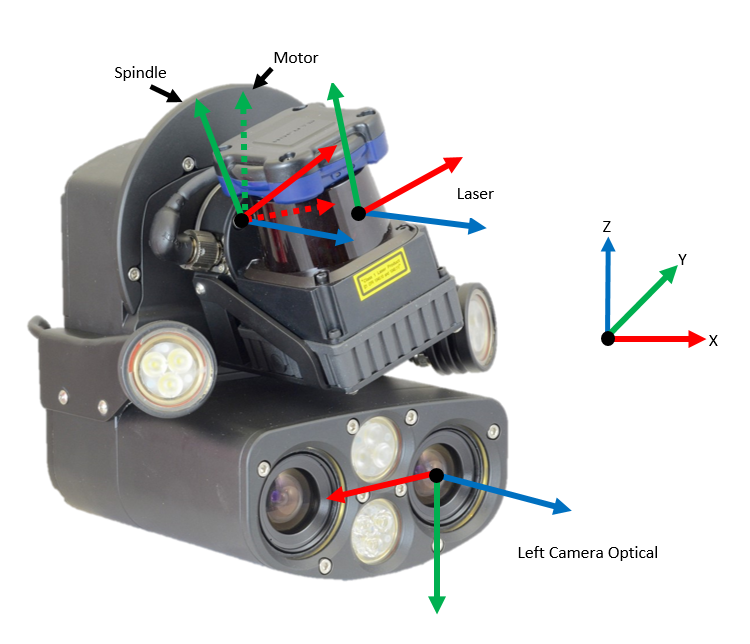 When the laser is spinning the motion between individual range returns is compensated by ROS internally using SLERP. This interpolation can also be used to account for external motions of the head; assuming the MultiSense-SL’s transform tree is a child of the frame in which the motion is occurring. The /multisense/lidar_points2 topic is a sensor_msgs/PointCloud2 message which contains laser data transformed into the /multisense/left_camera_optical_frame. Each laser scan is published as an individual point cloud. When transforming the laser data into Cartesian space both the scan angle and the spindle angle are linearly interpolated. This transformation is done without knowledge of external forces that may be acting on the sensor. The /multisense/calibration/raw_lidar_data and /multisense/calibration/raw_lidar_cal are a custom message types which contain all the information necessary to manually transform the laser data into the /multisense/left_camera_optical_frame. The /multisense/calibration/raw_lidar_data topic contains the raw laser data as well as information about the angle of the spindle frame at the start and end of the laser scan. The /multisense/calibration/raw_lidar_cal topic contains the two static calibration transforms 𝐻𝑀𝐶 and 𝐻𝐿𝑆 flattened to 16 element arrays in row-major order. Using these two topics the laser data can be manually transformed using a custom interpolation scheme external of the MultiSense SL ROS driver. The following excerpts of code use ROS’s TF and Angles packages to transform laser data into the /left_camera_optical_frame. The example consists of two subscribers; one to the /laser/calibration/raw_lidar_data topic and the other to the /laser/calibration/raw_lidar_cal topic. The above code constructs two http://docs.ros.org/api/tf/html/c/classtf_1_1Transform.html[tf::Transfrom] objects, __laserToSpindle_ and __motorToCamera++, from a single _/multisense/calibration/raw_lidar_cal message. These Frames correspond to HSL and HCM respectively. The above code generates a tf::Vector3 object pointInCamera which contains the x, y, and z coordinates of a single laser range point transformed into the /multisense/left_camera_optical_frame. The code linearly interpolates the laser scan angle as it spins counterclockwise from -135 degrees to 135 degrees. The angle of the spindle, originally published in micro-radians, is also linearly interpolated to compensate for motion due to the rotation of the spindle.